Add a "classic" touch to your next dinner party. 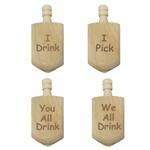 Beautiful solid Alder wood wine charms each laser engraved with a famous Latin phrase. Includes silver plated metal hoop and jump ring. Oval. Approx. 1-1/2" wide. Set of six wine charms with gift pouch. Classic Hanukkah dreidel personalized by laser engraving. Solid maple wood with Hebrew letter engraved on each face. Natural wood with or without text. Engrave name on top of dreidel. Worldwide and Israeli versions. 2-1/2" Tall. Includes carry pouch. 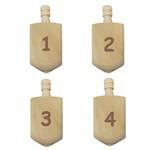 The classic dreidel game top takes on a new role in this drinking game. Solid maple wood with instructions engraved on each face. Natural wood. Engrave your name or message on top of dreidel. 2-1/2" Tall. Includes drawstring carry pouch. This dreidel drinking game directly follows the traditional dreidel game. Solid maple wood with instructions engraved on each face. Natural wood. 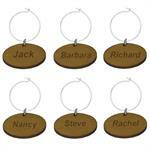 Engrave your name or message on top of dreidel. 2-1/2" Tall. Includes drawstring carry pouch. It's the women vs. the men in this team dreidel drinking game. Solid maple wood with instructions engraved on each face. Natural wood. 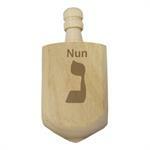 Engrave your name or message on top of dreidel. 2-1/2" Tall. Includes drawstring carry pouch. Remove the symbols and the classic dreidel game top becomes a four-sided spinning dice. Solid maple wood with number engraved on each face. Natural wood. Engrave your name or message on top of dreidel. 2-1/2" Tall. Includes drawstring carry pouch. 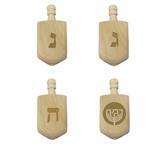 Remove the symbols and design your own custom dreidel. Solid maple wood with your text or images engraved on any/all faces. Natural wood. Also engrave your name or message on the top of dreidel. 2-1/2" Tall. Includes drawstring carry pouch. Add a personal touch to your next dinner party or event. 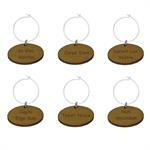 Beautiful solid Alder wood wine charms each laser engraved with a name or phrase. Includes silver plated metal hoop and jump ring. Oval. Approx. 1-1/2" wide. Set of six wine charms with gift pouch. Novelty wine glass let's you pour to match how your day has been. Generous 12-1/2 oz. wine glass permanently laser engraved. Lead free. Dishwasher safe. Includes wood wine charm laser engraved with "Nunc Est Bibendum " ("Now Is The Time To Drink"). 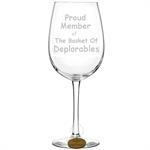 Novelty wine glass engraved to toast membership in "The Basket of Deplorables" for you or your friends. Generous 12-1/2 oz. lead free, dishwasher safe wine glass. Includes FREE matching, "Basket of Deplorables" laser engraved wood wine glass charm. Novelty wine glass let's you pour to match your stress level. Generous 12-1/2 oz. wine glass permanently laser engraved. Lead free. Dishwasher safe. Includes wood wine charm laser engraved with "Nunc Est Bibendum " ("Now Is The Time To Drink" ). Novelty wine glass engraved with the famous Latin phrase "In Vino Veritas" ("In Wine There Is Truth"). Generous 12-1/2 oz. lead free, dishwasher safe wine glass. 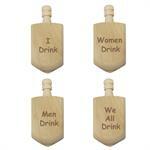 Includes FREE matching wood wine charm laser engraved with same phrase. Unique table top bottle trivets made from natural vegetable tanned ("veg tan") leather. Laser engraved with image of full Aztec "Sunstone" Calendar. Top sealed for maximum moisture resistance. Soft natural bottom safe on any surface. 6" Round. 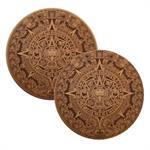 Unique drink coasters made from natural vegetable tanned ("veg tan") leather. Laser engraved with image of core of Aztec Sunstone Calendar. Top sealed for maximum moisture resistance. Soft natural bottom safe on any surface. 4" Round. Set of 4 coasters. Unique gift set made from natural vegetable tanned ("veg tan") leather laser engraved with images of Aztec "Sunstone" Calendar. Top sealed for maximum moisture resistance. Soft natural bottom safe on any surface. 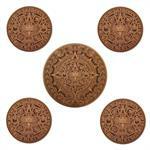 Set of 4, 4" coasters and 1, 6" trivet. 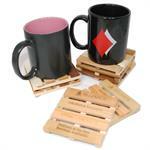 Unique drink coasters resemble cargo shipping pallets. Handmade in the USA from "cabinet grade" wood salvaged from Pacific Northwest cabinet shops. Semi-gloss finish. Felt feet. 3-3/4" x 3-3/4" x 1". 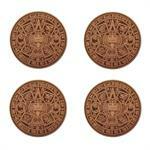 Set of 4 coasters with holder. Engrave 1 to 4 planks. 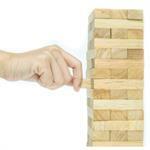 The classic wood tower game takes on a new role in this party game. 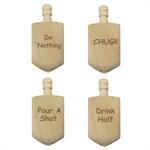 Solid natural wood blocks with drinking instructions engraved on selected block faces. Optional engrave your name or message on the edge of each block. Includes drawstring carry bag.